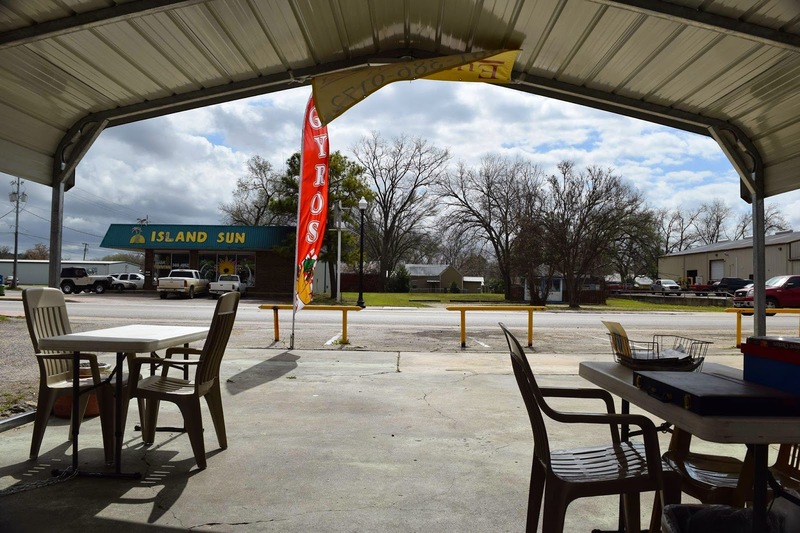 The Rules: We visit random eateries in Bastrop County searching for awesome food, amazing atmospheres, and excellent service. We have to ask a server what they suggest and whatever it is, we must try it. Then, we rate the restaurant using our five fork system (like stars, but better) based on service, atmosphere, food taste and presentation, and general cleanliness. 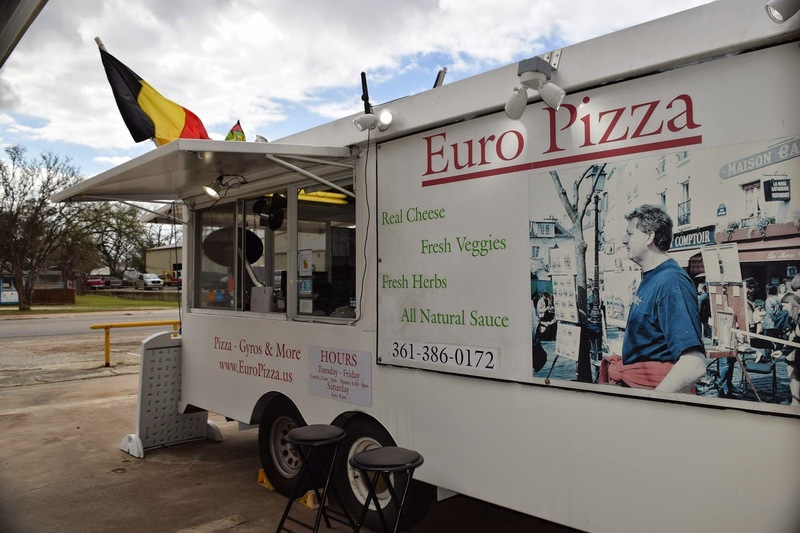 We drive out to Euro Pizza, a delightful little food trailer on Chestnut between the Schulman movie theater and the Yellow Gas Station (formerly known as the Green Gas Station). 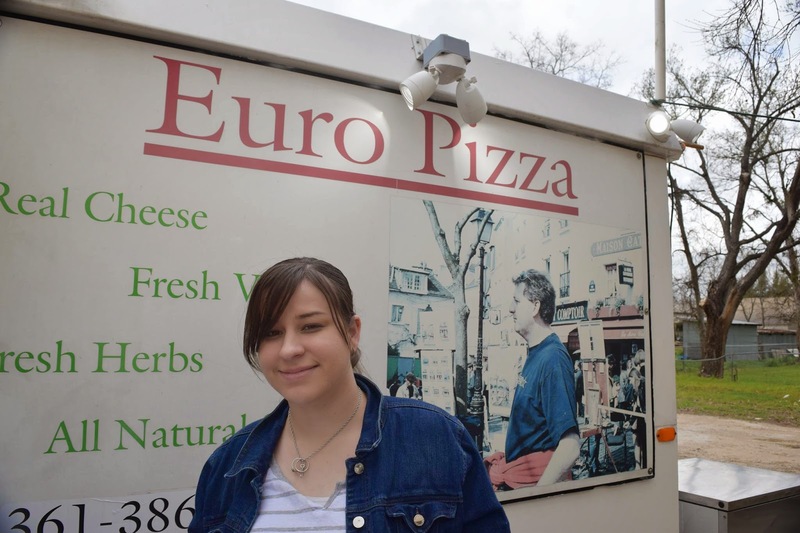 Austin, Bastrop’s weird cousin, is known for its food truck culture, and I love the idea of Bastrop following suit. Feeling rather disheveled from the blowing wind, we make our way up to the window where the owner, Terry, greets us warmly and hands us paper menus. We clutch them protectively so as not to lose them in the breeze. We tell him who we are and asks what he suggests. Smiling with enthusiasm, he tells us about his signature Tzatziki sauce on the gyros and points towards a veggie works pizza slice. I pick up a chicken gyro, and Cherie goes for the pizza. We order garlic breadsticks to go with our order and a couple of sodas to drink. I'm surprised and delighted at the price, which is lower than you would expect for fresh pizza. As I mentioned before, it is pretty windy out, so we contemplate eating in the car, but in an attempt to be brave and adventurous, we opt to stick it out at their covered picnic table instead. While waiting for our food, we ask Terry to tell us about the business. Talking to them is like a conversation with old friends; they are friendly and happy to share. He and his wife Valerie have owned the business since 2005 and were based in Rockport until they decided to return to the Austin area, ending up here in Bastrop. They make their own sauce and use only fresh ingredients for all their foods. After a little while, our order is ready. 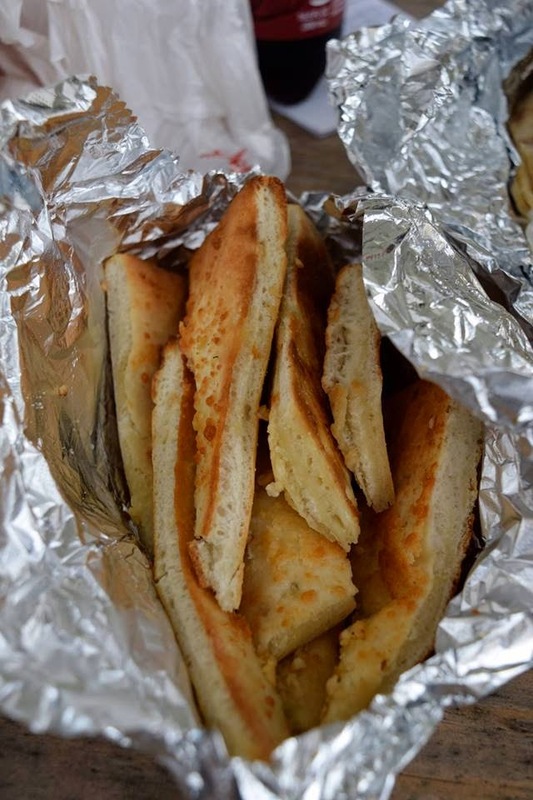 Everything is hot out of the oven and smells amazing, We start with the breadsticks, which are warm and crispy and smothered in garlic and parmesan. I'm ready to eat them all without sharing, despite the generous portion. (Note to self, order two next time). Cherie asks for sauce to dip the bread in, which they are happy to supply and even ask if we want it warmed. The pizza is a medium-sized slice heaped with fresh veggies and cheeses, and we excitedly dig into it. It is delicious with a homemade crisp crust, sweet and savory sauce, and veggies that taste like they are right out of an garden in Italy. 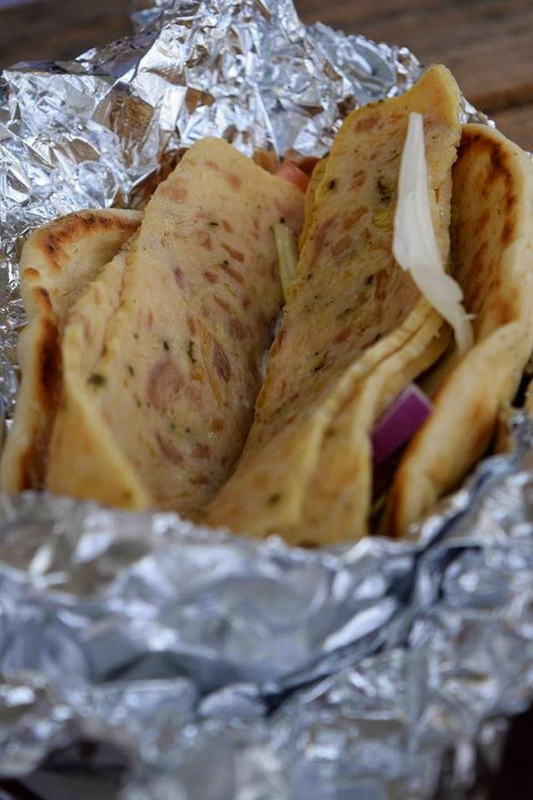 The gyro is my one source of sadness at Euro Pizza. While it's a good size and the pita is warm and soft, the chicken is lacking the flavor I love so much in Greek food. 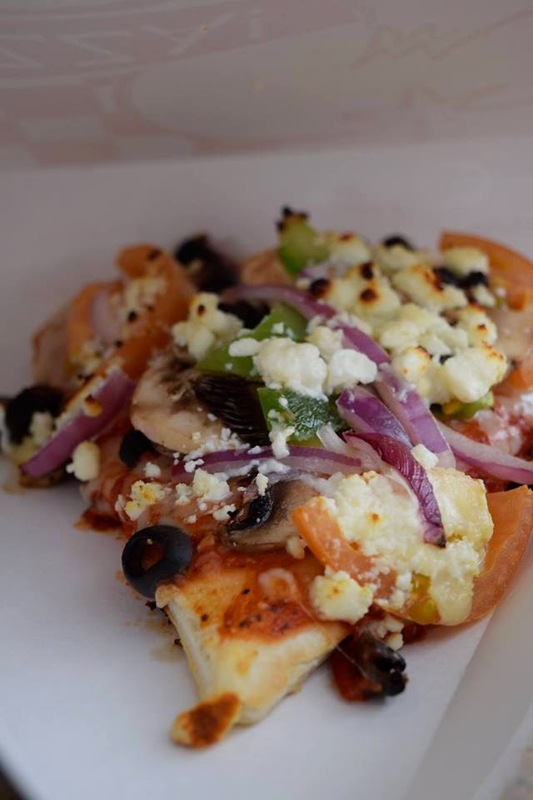 The veggies on the gyro are fresh and crisp, but I would probably stick to the delicious pizza on my next trip. Altogether, I think it's pretty great that we now have an option for street-vended food to grab while strolling down Main Street. I love the fact that I can now enjoy being out and about on a perfect day with an equally perfect slice of pizza from some of the friendliest people in town.